Is it time for more training? According to the statistics for this blog, one of the top five all time posts is this one dealing with training new hires. 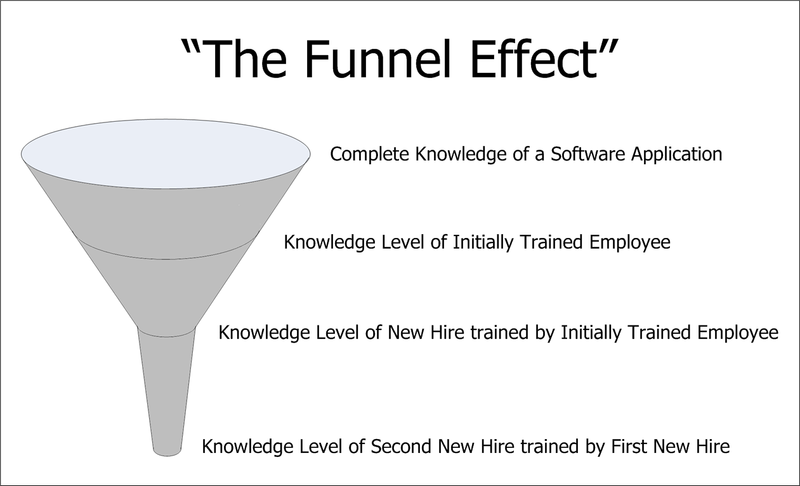 One of the reasons this post is in the top five may be people typing “funnel effect” into a search engine and finding this image. A picture is said to be worth a thousand words, and this one definitely is! I believe it is important for new hires to get off to a great start. Getting good training is a key to insuring that good start. Who better to train your new hires in the use of your billing software than your vendor’s trainers? Even as adventuresome users who fall into the second category, many of us are creatures of habit. We become comfortable with a certain way of doing things and fall into predictable patterns. Remember the TTWWADI syndrome post from six weeks ago? I’m often surprised when I visit customers and realize some of the things they aren’t doing that they could be with our software. More surprising, are some of the things they do as workarounds that they could be doing with the software. Is it time for a business review? If you’re satisfied with your billing software and it’s been a couple years since you’ve received training or had someone from your software vendor review your operation, maybe it’s time for a business review. If you’re not satisfied with your current software, then it’s definitely time for a business review. Taking the time to conduct a business review before starting the search for new software can help facilitate the replacement process. Is your office operating as efficiently as it could be? Are you taking advantage of all the features of your software? Could your business office operate more efficiently? If you’re not sure, please give me a call at 919-232-2320 or e-mail me at gsanders@logicssolutions.com to learn how a business review could benefit your utility.